Who was weed actually legalized for? California’s legalization of marijuana, which took effect on Jan. 1, allowed thousands to rush to the nearest dispensary to pick up an eighth. What it did not do is offer adequate recompense for the countless Black and Brown people who were arrested, are serving, have served or have died in prison because of marijuana-related charges. When the Adult Use of Marijuana Act (Proposition 64) was proposed in 2016, it was met with controversy. Factors that led to its passing included the mental and physical health benefits of consumption — and the promise of turning a profit for the state. The problem: no one listened when Black and Brown people preached the same sentiment. In fact, they were sentenced to years in prison on felony charges for using marijuana for medicinal purposes. Nixon’s War on Drugs gave law enforcement a platform to terrorize nonwhite communities. About 1 in 5 of the 2.3 million prisoners in the United States are serving time for drug-related offenses, and over 1 million new arrests for drug possession and use each year. According to a study conducted by the ACLU from 2001-10, Black and white communities consumed marijuana in relatively equal amounts, but only communities of color were subjected to random stops and police busts. Drug criminalization has many facets, but the emphasis on anti-marijuana laws began in the 1910s to target Mexican and Mexican American communities. 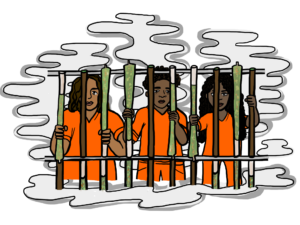 Though marijuana is not a hard narcotic, law enforcement uses its false reputation as a “gateway drug” to incarcerate Black and Latinx people. Prison is associated with major felonies. It’s where our society has chosen to send its murderers, rapists and thieves. It’s no place for human beings caught with a blunt in their pocket. When white people are stopped by police for having more than an ounce of marijuana, they are frequently charged with possession, a misdemeanor. This and a $500 fine are a veritable slap on the wrist compared to what was often the fate of Black and Brown people prior to legalization: being charged with intent to distribute and upward of three years in prison. Even after surviving a sentence, and not all incarcerated people do, the next consequence is usually parole or probation — stipulations for their freedom. Depending on state-specific legislation, they can also lose basic human rights such as caring for their children, employment in higher-paying positions and the right to vote for the rest of their lives. This blanket approach to felony charges has kept people of color convicted of “intent to distribute” out of the voting pool for decades. Those most affected by marijuana’s criminalization weren’t allowed to vote for its legalization in November 2016. Even if a person does not go to prison, simply being arrested for weed-related crimes can stay on police records for years. This can damage their chances for getting work and acquiring loans and can complicate the process for receiving government assistance. Weed became trendy in white mainstream media. It does have medicinal value, but there is something to be said of the timing of its legalization. The white American population took the backseat while police disproportionately rounded up communities of color for decades. Now that a significant amount of small-time dealers are behind bars, white industry can monopolize marijuana’s recreational use, capitalizing on profit. The law isn’t inclusive. For undocumented people in California, the legalization of marijuana does not change federal immigration laws regarding drug use. In the eyes of U.S. Immigration and Customs Enforcement, if an undocumented person is arrested for marijuana use, their arrest is grounds for deportation. So while an undocumented immigrant can meet all the criteria for legal purchase of marijuana in the state of California, being caught is a dire risk. However, this doesn’t seem to be an issue for white consumers. Legalization does not offset the disproportionate target on nonwhite communities, looking to Colorado and Washington state as reference. Black people are still twice as likely to be arrested for marijuana-related violations than white people, according to 2014 statistics. Between police brutality, mass incarceration and the school-to-prison pipeline, Black and Brown bodies are targets for racial erasure. The Adult Use of Marijuana Act promises individuals incarcerated for marijuana-related offenses can now see their charges reduced or even have them dropped. This of course comes at the timeliness of the legal system, in which the appeal process has proven in the past to be a long and arduous journey. The cannabis industry can also deny former convicts, including those brought up on nonviolent drug offenses, from operating a dispensary. This is a way to keep people of color out of an industry already demonstrating success. What legalization doesn’t address is how people are expected to put their lives back together after prison. What legalization doesn’t address is protection for undocumented residents to legally purchase marijuana. What legalization doesn’t address is if the state will allot any money from its newly booming industry to anyone but white business. So, marijuana was legalized in the state of California — but evidence shows it wasn’t for the benefit of those most impacted by its criminalization. Once again, white culture has appropriated Black culture, receiving praise and a huge boost of industry. Black business is thrown in jail and white business picks up the profit.